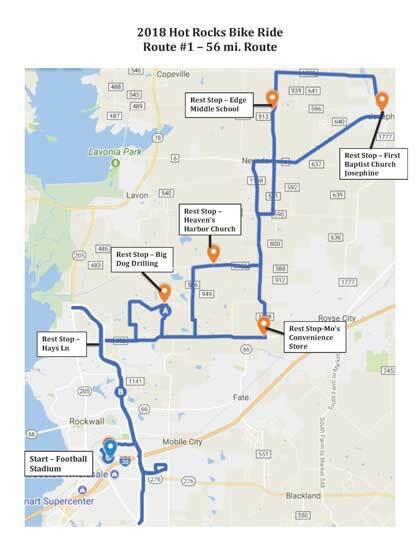 The 56 mile route begins with a 20 mile loop of lightly travelled 4 lane road with moderate grade near the Rockwall football stadium, followed by 25 miles of increasingly rural roads in Rockwall and Collin Counties. The middle 20 miles is very rural with light traffic and modest grade. The final 10 miles is a return to the football stadium in Rockwall County. There are 6 rest stops along the route. The 56 mile riders start at 7:30, and should start turning off John King Boulevard onto FM 552 about 20 miles into the ride. The 42 mile riders will start at about 8:10 and will turn from John King Boulevard onto FM 552 about 6 miles into the ride. Once the 42 and 56 mile riders reach the turn onto FM 552, both courses are the same for the final 36 miles.